The original RoboCop is one of the most treasured films of the 1980s, and quite possibly of all time - its satire of American culture and relentless violence made it a compelling and equally humourous experience for adult audiences. When a film earns such classic status, remaking it for the modern crowd is never gonna end well - after a slew of delays, the new slicker, black RoboCop has arrived to lukewarm reception from fans and critics alike. If we take off our rose tinted glasses for just a few minutes, does it hold up on its own? In 2028, Omnicorp and its CEO (Michael Keaton) is the king of innovative robotic technology - their fleet of drones and robots are distributed around the globe to perform law enforcing duties humans no longer need to risk their lives for. However, the American people oppose their technology - believing a robot cannot make a moral judgement when fighting crime. 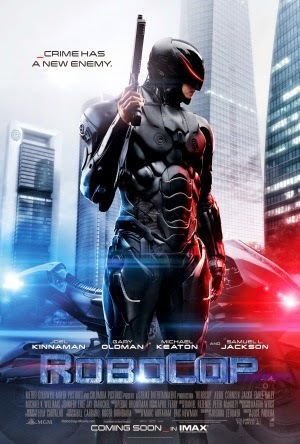 Omnicorp's subsequent efforts to combine the human conscience with robotic technology thrive when police officer Alex Murphy (Joel Kinnaman) is brutally injured in the line of duty. Reborn as the cybernetic RoboCop, Murphy is forced to adjust to his new purpose and the impact it has on his life, begging the ultimate question: who is in control, man or machine? It's tough to compare this remake to the original cult classic as their only similarity is the central concept of a cybernetic cop; outside of this, a number of thematic differences and plot threads make the two vastly different experiences. What's immediately noticeable to fans of the original is the lack of extreme violence - this RoboCop is nowhere near as gory or intense as its 1987 namesake, which is not a problem but will inevitably disappoint some fans. This remake's action stems mainly from the intense but bloodless firefights, which can be nauseating and a bit repetitive, but they still provide some thrilling set pieces. RoboCop does a surprisingly nice job of conveying the emotional impact the events have on protagonist Alex Murphy and by extension his wife and son. There's some beautifully handled tender moments between these characters to pack a satisfying emotional punch into this storyline, making it a little more complex than it may initially seem. Unfortunately character development isn't as refined in some other parts of the film; initially the pacing is a complete disaster, exemplified by a cumbersome opening 10 minutes with Samuel L. Jackson's character and little to no development for Murphy before his transition to RoboCop. Things improve significantly as the film moves forward, but there's still problems. There's a lot of key characters here; Raymond Sellars (Keaton), the CEO of Omnicorp, Dr. Dennet Norton (Gary Oldman) who pioneers the RoboCop technology, and Pat Novak (Jackson), the host of his own show and supporter of Omnicorp's robotic armada. This creates serious pacing issues at times and it can be difficult to keep pace with everything during the dramatic tension following Murphy's injuries. The filmmakers evidently do their best, but sometimes it's just too much for them to handle. RoboCop is much better than some people may initially think; it has dramatic depth, some freaky moments and generally fantastic performances. These positives are bogged down by some saddening issues with pacing and development, but there's still much to enjoy here.